A while ago, I saw a trailer for a fascinating-looking documentary called “Dive!” about a group of friends who routinely went dumpster diving for food at big chain grocery stores, and were eating perfectly good, many times super high-quality food that had simply met it’s “pull date” so it was thrown into the trash. Seifert begins to wonder why so much of this still perfectly safe, edible food is thrown away every day, and cannot get answers from the grocery store managers. He gets referred to corporate offices, but still cannot get information from them. He talks to Dr. Timothy Jones, former head of The Garbage Project at the University of Arizona, who tells him that at the commercial food level, there is no regulation or training on reducing food waste. He also says that 50% of the food that is produced in America never makes it to the table. Jeremy visits the LA Regional Food Bank, where he learns that roughly just over 1 million people in LA County are at risk for hunger at some time in the year, meaning they don’t know where their next meal will come from. The Food Bank is short of meeting the needs of these people by about 11 million pounds of food every year, even though they work with over 900 charitable organizations and almost all of the major food chains are on the donor list. Jeremy does the math, and finds that in LA County alone, almost 3 billion pounds of food is wasted annually, and that if people were able to save even 1% of that figure, it would be almost triple what the food bank is short every year. One side note: While the message the documentary presents is of the utmost importance, and it is one that many people wouldn’t be able to fully grasp without seeing the numbers and stories, I did feel the voices of the people in it (Seifert in particular) were a bit self-important and self-righteous. 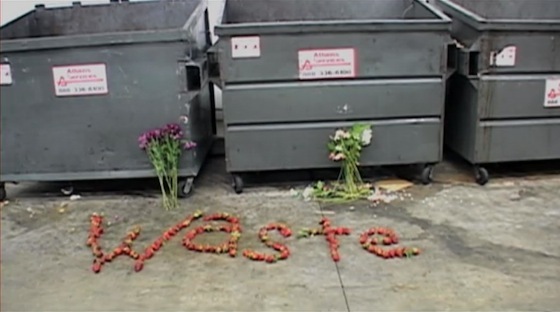 They talk about American food waste and how ridiculous it is, then proudly show off their dumpster hauls, use salvaged food to write words in their stop-motion animations through the film, and yet only gloss over the fact that they are also guilty of wasting food, just like the rest of “us”. I’m not discrediting any of the great information they put forth in the documentary – again, there is definitely is a problem in our food system that people need to know about. I just feel that the tone is a bit cynical and idealistic at the same time – with an almost affected simplicity – and that grated on me a bit. Like his quote above, when Seifert found that he had an overabundance of food, it was easier for him to devalue it, and that’s unfortunately the situation most of America, in our wealthy, capitalist, consumer society, is in – I’m not sure if he was being honest in that scene of the film and it had not occurred to him that that’s exactly what is happening here, or if he was just acting to make it appear that he was realizing it for the first time. I don’t know if that was Seifert’s true voice, or if he thought he needed to take that tack to make his presentation more easily understood to a broader audience (he does have three young children). In any case, the film is definitely a worthy watch, despite my feelings on the tone. 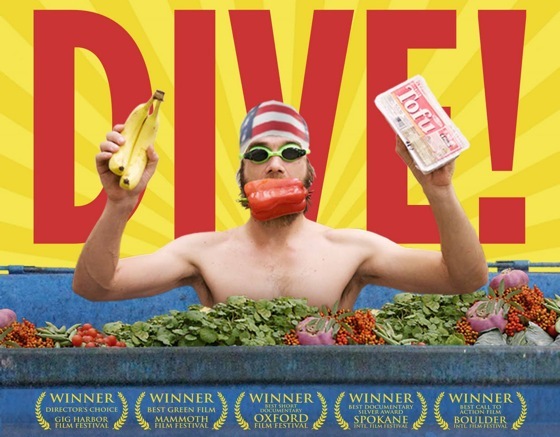 At the end of the film, Seifert and his friends set out to start a grassroots campaign to rescue the food designated for the dumpster and redirect it to local food banks. They’ve broadened their “Eat Trash” campaign and you can read more about it and get involved at their website. I highly recommend watching the film, but you don’t have to stop there. Visit their website and see what you can do to help end hunger where you are, and hopefully someday, around the world!